How Far is Emerald City? Go beyond ordinary. Live Unique, in a centrally located haven situated between the coastal districts of VIZAG – VIZIANAGARAM – SRIKAKULAM. 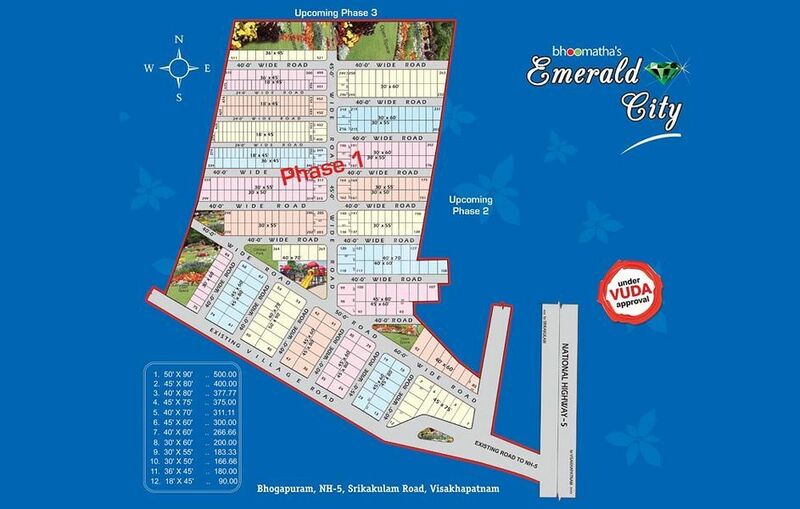 BHOOMATHA presents “EMERALD CITY” a predominantly pollution free, ultimate green residential layout on Vizag – Srikakulam NH-5 Road, identified as one of the fastest developing and growing 6 LANE HOWRAH – CHINNAI INDUSTRIAL CORRIDOR. Bhoomatha’s “EMERALD CITY” has the best road connectivity surrounded by lush green nature and designed by eminents in the industry. The layout is equipped with all amenities fir a premium lifestyle. The project is environmentally designed with Solar Lighting and situated in the heart of the project, is a striking Club House with multitude recreational options – viz., Coffee Shop, Swimming Pool, Parks, Walk ways and kinds Arena. Step into “EMERALD CITY” to experience a unique vibrant and Grandeur Lifestyle.